Home » Herbicides/Algaecides » Duckweed & Pondweed Control » SONAR Genesis 1 Gal. Fluridone for Duckweed & Lake Weed Control + Free Shipping! SONAR Genesis 1 Gal. Fluridone for Duckweed & Lake Weed Control + Free Shipping! SONAR GENESIS - 1 Gallon A new and improved Sonar formulation designed with the applicator in mind, Sonar Genesis is the latest Sonar formulation innovation from SePRO - 25 years and still getting better! 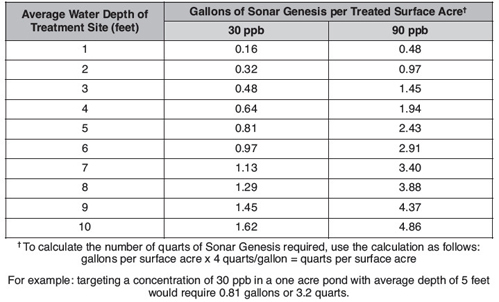 Sonar Genesis was designed to be an easier to use formulation that lasts longer in the water and provides a faster knockdown on many floating and emergent weed species. This convenient 1/2 lb. formulation provides a lower cost per gallon product improving operations for applicators. SONAR Genesis Sonar Genesis - This 6.3% Fluridone product is excellent for whole lake treatments. It is a selective systemic aquatic herbicide for management of aquatic vegetation in fresh water ponds, lakes, reservoirs, drainage canals, and irrigation canals. SONAR Genesis Sonar Genesis is a selective systemic aquatic herbicide for management of freshwater aquatic vegetation in ponds, lakes, reservoirs, drainage canals and irrigation canals, including dry or de-watered areas of these sites. Sonar Genesis is absorbed from water by plant shoots and from hydrosoil by the roots of aquatic vascular plants. For in-water treatments, it is important to maintain the specified concentration of Sonar Genesis in contact with the target plants for a minimum of 45 days. Rapid water movement or any condition which results in rapid dilution of Sonar Genesis in treated water will reduce its effectiveness. In susceptible plants, Sonar Genesis inhibits the formation of carotene. In the absence of carotene, chlorophyll is rapidly degraded by sunlight. Herbicidal symptoms of Sonar Genesis appear in seven to ten days and appear as white (chlorotic) or pink growing points in many susceptible plant species. Under optimum conditions, a minimum of 30 to 90 days may be required before the desired level of aquatic plant management is achieved. Plant species susceptibility to Sonar Genesis may vary depending on time of year, stage of growth, and water movement. For best results, apply Sonar Genesis prior to initiation of weed growth or when weeds begin active growth. Application to mature target plants may require an application rate at the higher end of the specified rate range and may take longer to control. Sonar aquatic herbicide is a selective, root killing, systemic herbicide that does not cause oxygen depletion. It is absorbed by leaves and stems directly from the water and by the roots from the hydrosoil. Sonar inhibits the plant’s ability to produce carotene. Without this ability, chlorophyll is rapidly degraded by sunlight and the weed dies. It is extremely concentrated and a few ounces in a small pond will keep the weeds out all summer. Entire ponds should be treated at one time and it should be applied early in the season. Application to Ponds SonarOne may be applied to the entire surface area of a pond. For single applications, rates may be selected to provide 30 - 90 ppb to the treated water, although actual concentrations in treated water may be substantially lower at any point in time due to the slow-release formulation of this product. When treating for optimum selective control, lower rates may be applied for sensitive target species. Use the higher rate within the rate range where there is a dense weed mass, when treating more difficult to control species, and for ponds less than 5 acres in size with an average depth less than 4 feet. Application rates necessary to obtain these concentrations in treated water are shown in the following table. For additional application rate calculations, refer to the Application Rate Calculation—Ponds, Lakes and Reservoirs section of this label. Split or multiple applications may be used where dilution of treated water is anticipated; however, the sum of all applications should total 30 - 90 ppb and must not exceed a total of 90 ppb per annual growth cycle. SonarGenesis may be applied to the entire surface area of a pond. For single applications, rates may be selected to provide 30 - 90 ppb to the treated water, although actual concentrations in treated water may be substantially lower at any point in time due to the slow-release formulation of this product. When treating for optimum selective control, lower rates may be applied for sensitive target species. Use the higher rate within the rate range where there is a dense weed mass, when treating more difficult to control species, and for ponds less than 5 acres in size with an average depth less than 4 feet. Application rates necessary to obtain these concentrations in treated water are shown in the following table. For additional application rate calculations, refer to the Application Rate Calculation—Ponds, Lakes and Reservoirs section of this label. Split or multiple applications may be used where dilution of treated water is anticipated; however, the sum of all applications should total 30 - 90 ppb and must not exceed a total of 90 ppb per annual growth cycle. Dosage: (For watermeal, dense weed infestation or difficult-to-control species) use the 90 ppb rate, applying 66% on day 1, followed by 33% of your remaining product on day 20. Do NOT spray onto floating plants, rather, spray into the water. NOTE: For Watermeal, use the 90ppb rate starting with 60 ppb on day 1, followed up with 30 ppb on day 20. ***And, For VERY HARD to control watermeal, use the "NUCLEAR OPTION" by incorporating Galleon SC at a rate of 1 qt. per acre in addition to Sonar Genesis. Galleon® SC Herbicide for Lakes and Ponds 32oz + Free Shipping!